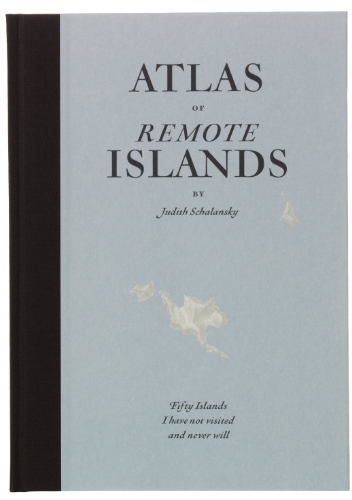 The Atlas of Remote Islands by Judith Schalansky is an extraordinary book – an armchair exploration of some of the world's most remote and fascinating places. It is fascinating, illuminating and extremely beautiful. The Island Review: Growing up in East Germany in the 1980s, your youthful fascination with the outside world and with maps and atlases is entirely understandable. But what was it that drew you to islands in particular? Why did they provide such a focus for your imagination? Judith Schalansky: I grew up near the Baltic sea. My grandparents lived on the island of Usedom. It was always something special to visit them, although Usedom is an island which is connected by two bridges to the mainland. To go over this bridge felt like entering another world. It is no coincidence that Thomas More located his Utopia on an island. These land spots on the sea seems to be natural kingdoms, little continents, tiny worlds in miniature. If you have an island, you have the world. You can even tell world history by islands. That is why I called them footnotes to the mainland. Islands, especially those that seem most remote, are perfect places. They capture your imagination. For people who feel stressed, the island is an ideal image of a place where you can find peace, and where you can finally concentrate on what is really important. Maybe that’s where the question originates: What would you bring to a desert island? Each utopia wishes for a new beginning, for a chance to do everything differently. All it takes is untrodden territory and an answer to the question: Is another, better life possible? TIR: There seems to be a real contradiction at the heart of your book. You demonstrate both the enduring allure of remote islands, and yet, at the same time, the stories you tell make it clear that many of these islands are terrible places, where awful things have happened. The title of your introduction states it most clearly: ‘Paradise is an island. So is hell.’ Could you say a little more about this contradiction, please? JS: Islands are not only real places but projections of human ideas for a better world and the social wish to cast out undesirable subjects and objects at the same time. So it is not surprising that the image of remote islands is located somewhere between utopian paradise and jailhouse. My book is about the huge gap between longing and reality. My motivation to create this atlas was a childlike belief that there must a place somewhere that is truly beautiful. But as it turned out, it does not work that way. Most of the islands I chose are barren land, without a tree or even drinking water. What I did not expect was that almost all of the stories I would dig up were so horrendous: shipwrecks, failed expeditions, prison colonies, megalomaniac conquerors, cannibalism, manslaughter, murder and mayhem. Islands are rather unsuited for utopias. Man’s will to survive will turn him sooner or later into a beast, turning a dream into a failure. Remote islands are closed, secluded places that do not exactly bring out the best in people. But the more dreadful the occurrences are, the better the story gets. Finding paradise is a wonderful thing, but it does not leave you with much to write about. No wonder I found more terrible than happy stories. TIR: This is, in some senses, an anti-travel book. You have not visited any of the places you write about and, as the subtitle announces, you never will. Indeed, you claim that the longing inspired by looking at an atlas ‘will always be . . . far greater than any satisfaction to be had by attaining what is desired’. This seems a very interesting and quite radical attitude. Do you dislike all travel? JS: If the world had not been entirely discovered yet, I would probably have become an explorer and would have travelled to the most remote places. The way it is now, when the world is nearly all accessible, I have no other choice than to stay at home and to write. Reality really is overestimated. When I go into bookshops, it makes me smile to see my atlas, with its subtitle ‘Fifty Islands I Have Not Visited and Never Will’ in the travel section, alongside guidebooks and the inspiring memoirs of explorers, circumnavigators and mountaineers. I think what leads people to travel such long distances is the wish to experience a deeper knowledge of their inner selves in the distance, to recognise themselves in the reflection of the other while climbing an 'eight-thousander', on a pilgrimage or on a lonely island. However, in the end we always take ourselves wherever we go. As Chesterton put it: 'The biggest adventure waits for us in the streets where we grew up'. He is right, I guess. Judith Schalansky was born in East Germany in 1980. She is the author of four books, including the highly acclaimed tribute to blackletter fonts Fraktur Mon Amour and, most recently, the novel The Giraffe's Neck. Schalansky is also a freelance designer and teaches courses in typography at Berlin's Potsdam Technical Institute.